We must keep our momentum going - Antonio Conte challenges his team. 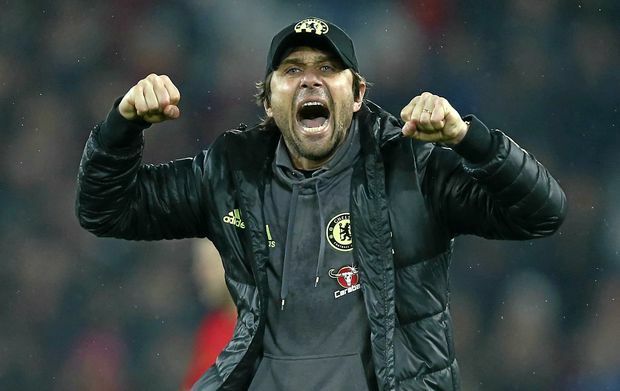 Antonio Conte has been speaking ahead of Chelsea's trip to Burnley on Sunday afternoon and has urged his players to focus on themselves and maintain his sides current momentum. In recent weeks Chelsea have faced Tottenham, Liverpool and Arsenal and have come away with just four points from those games which in any other season would be trouble. However, with sides below us dropping points for one reason or another, we have managed to maintain and then extend our lead at the top of the Premier League. With Manchester City the next game against our direct rivals for a top four finish and possibly the title on April 5, Chelsea have a run of fixtures that many believe on paper are favourable beforehand. We face Burnley, Swansea, West Ham, Watford, Stoke and Crystal Palace before we play City and Antonio Conte has urged his players to kick on. 'Now we are on top of the table, but this league is very tough. For me now it's important to continue to push and to exploit this momentum. If you send the right signal for us and not for the other opponents, it's very important.' Source: Daily Mail. He is spot on and it's so important that we focus on these next six games to try and take maximum points which, as we know in the Premier League is difficult. We are due to face teams that are fighting for their Premier League survival and teams that are trying to force their way into mid-table and beyond so it will not be easy as anyone can beat anyone on their day. If Chelsea can take fourteen points from those six games (four wins and two draws) then I would be happy and it will be interesting to see if the sides below us are able to keep up with that points scoring record. The Arsenal game was a massive result and it sent out a message to our rivals that we are a very different team compared to that of the beginning of the season. People will tend to focus on the bigger games amongst the sides fighting for the Champions League places and the title, however as we have seen this season (Hull beating Liverpool last week as the perfect example), you have to earn the right to win games in his league as the quality of the so-called lesser sides has improved so much. Chelsea sit in prime position, nine points clear of Tottenham as our nearest challengers. Tottenham travel to Anfield on Saturday night and could put down their own marker with three points to close the gap to six points ahead of our game on Sunday. Then again, if they dropped points it would give Antonio Conte's side a boost ahead of a difficult game with a chance to extend our lead even further. We must exploit our momentum.